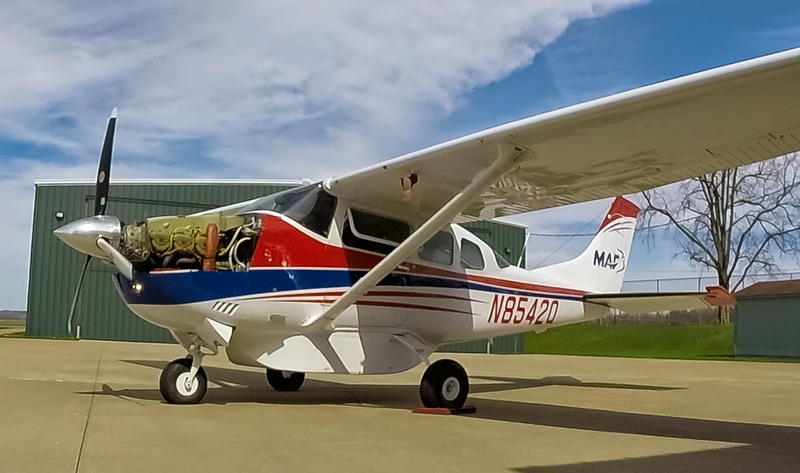 The last week of October, I left Coshocton with two other men from MMS Aviation, and drove to Waco, Texas to work on a Twin Comanche owned by The Harvest is Ripe Ministries. This small ministry's focus is church planting and pastoral leadership training in various parts of the world. If the name of the ministry sounds familiar, it's because I recently finished overhauling an engine for them. 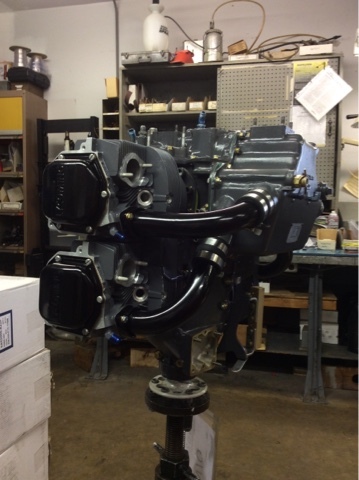 In fact, the main reason for our trip to Texas was to deliver and install this engine, and to install another engine that was overhauled by a different shop. The trip lasted a total of eleven days, and during that time we worked on the engine installations and several other maintenance tasks. It was a good trip, and I enjoyed getting to know Victor Crawford, the owner of the airplane. 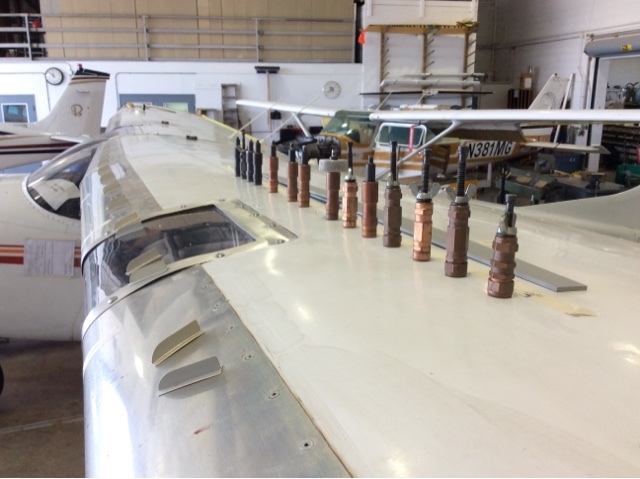 Due to some unforeseen circumstances, we couldn't complete all the work we had hoped to accomplish, but we did get both engines and one propeller on the airplane and got a good start on several additional maintenance items. Even though the airplane was not in airworthy condition when we left, we helped move the project to the point where a local mechanic can pick up the work and hopefully get the airplane flying before too long. Please pray that God will provide the people and resources needed to finish the works so that Victor can put the airplane to use in South America. After returning to Coshocton I put together a video to show some of the work we did, and to allow Victor the opportunity to share about his ministry. You can view it below. As I mentioned in the last post, we had the privilege of participating in Calvary Church's missions summit last week. Four couples were invited to the missions summit. Two of them were veterans of overseas missions work, and two of them (including us) are still preparing to go. It was humbling to stand next to these veterans, who have many years of experience under their belts. But we were also very encouraged by them, and by the staff and members of Calvary Church. Also invited to the missions summit was Jeff Hartensveld, Director of Mobilization for AGWM. Jeff spent more than 20 years as a church planter in Indonesia before coming back to the States to serve in his current role. He gave a very encouraging message in Sunday morning's services, and we had the opportunity to interact with him throughout the week. During one of these interactions, we discovered an interesting connection with MMS Aviation. As I told Jeff about my plans to serve in missionary aviation, he told me how valuable the airplane was in Indonesia, particularly after the tsunami in 2004. In his words, "I was platinum on MAF [Mission Aviation Fellowship]". As it turns out, the airplane that I helped to rebuild and send to Suriname (see page 2 of MMS's latest newsletter) was one of the airplanes that Jeff utilized after the 2004 tsunami! It was exciting for me to meet someone who had been a passenger on the very airplane I worked on, and the type of airplane I will be flying in a few years. This was also a validation of the importance of missionary aviation in advancing world missions, especially to those who have never heard of missionary aviation. I grew up in the Assemblies of God church (at Calvary, in fact), and that's where I first gained a heart for world missions. However, Tara and I have attended churches of various denominations as we moved from place to place, and MMS Aviation has no denominational affiliation. While Christian denominations still have their place, it is encouraging to see different churches and organizations working together for the common goal of making Christ known to every nation. We were the only non-A/G missionaries at the missions summit, yet we were embraced by everyone we met. If you know my story, you may recall that my desire was to begin training as a missionary pilot right after high school. That didn't happen, and instead I ended up going to college at my last-choice school while living at home (mainly to avoid going into debt). As it turned out, I had a great experience there, and met my wife at Toledo. Nevertheless, I still had to deal with the pain of giving up my dream of taking the Gospel to remote frontiers through aviation. Since then, it's been difficult for me to "dream big", for fear that I will have to go through the same disappointment all over again. But as Tara and I reflected on our week, we started dreaming about ways that God could bring together our passions and gifts (along with some others in the Church) in a unique and exciting way. I can't elaborate here, but you can be praying that God would pave a way into a place that currently seems impenetrable—one that we would love to invest our lives in. Well, I planned on writing more, but it's time for some breakfast. Maybe I will pick this up in a later post. Thanks for taking the time to stay updated, and for your support of our work with MMS Aviation! 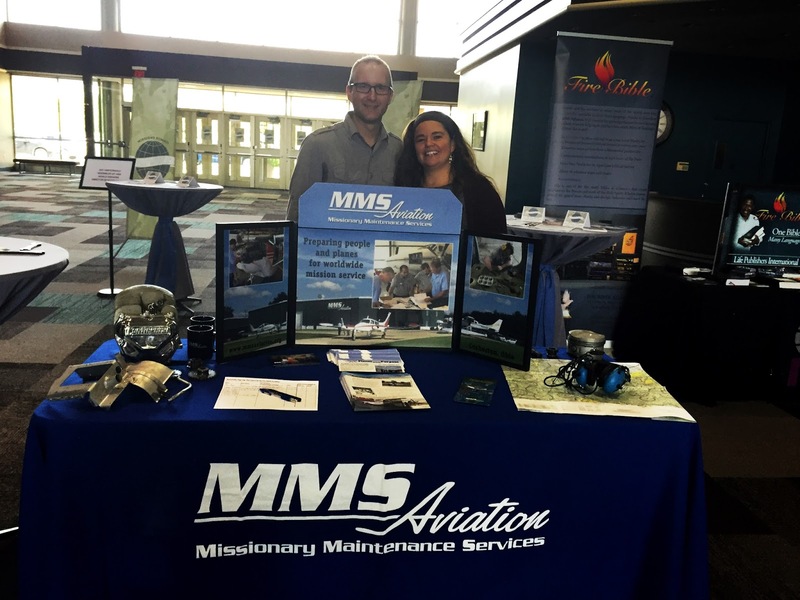 This week we have the privilege of participating in the annual Missions Summit at Calvary Church in Maumee, Ohio. We, along with four other guests, were invited to spend several days with the people of Calvary, sharing our ministry and our passion for reaching the world with the hope of the Gospel and the love of Christ. Yesterday was a busy day, sharing briefly in three morning services, talking in children's church (twice), and speaking with four groups of youth in the afternoon. In the evening we came back to share a meal with about 20 people from Calvary, and to talk more about our work with MMS Aviation and our heart for the world. Although it was a lot to pack into one day, we really enjoyed seeing old friends and making new connections with the other guests and the people of Calvary. It's exciting to see what God is doing around the world, and to see how our little mission fits into the larger work of building the Kingdom of God. Throughout this week, we will have several more opportunities to interact with the people of Calvary Church, giving them a glimpse of our work with MMS, and encouraging them to live their lives for the glory of God. We appreciate your prayers over the next few days as we continue to participate in the Missions Summit, and look forward to sharing more with you later this week! This is an exciting week! The engine I've been overhauling for The Harvest is Ripe Ministries is on the engine stand and should be making noise on Friday! There are just a few small things left to do before it is ready to run. This overhaul has been a great opportunity for me to gain engine experience that will be valuable when I eventually serve on the field as a pilot/mechanic. Not only that, but we are providing a quality overhaul to a small ministry with a tight budget, while saving them thousands of dollars compared to commercial overhaul shops. Whenever we see a project —whether a complete airplane or an engine—leave MMS, it is a great reminder of the unique ministry of MMS Aviation, and the privilege it is for me to be a part of it. After the engine runs and paperwork are complete, I will be moving back to the Guatemala 206 project for Missionary Air Group. This Cessna 206 is an airplane that I will hopefully fly in the next couple years as I serve and train with MAG. 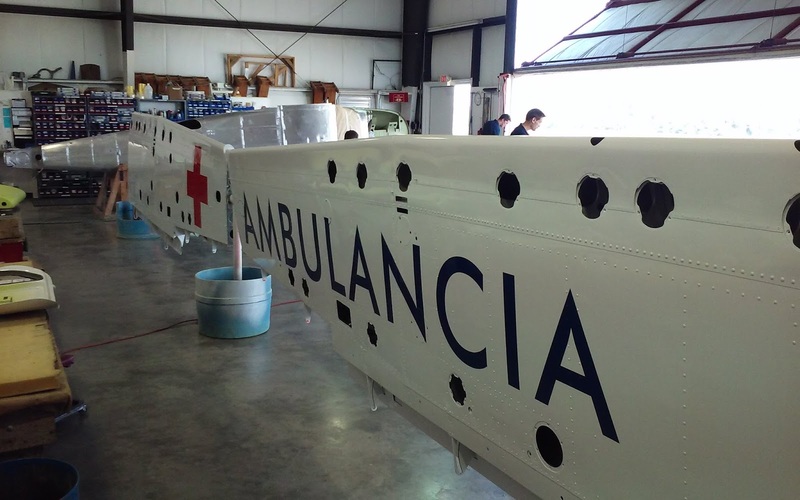 After being repaired, the wings recently got a fresh paint job, thanks to Josh Adelsberger. The fuselage and other components are being repaired now and will be painted next, and before long we will begin assembly of the airplane! 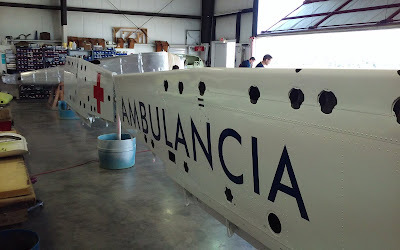 Here's a photo of the repaired and repainted wings. Check back for more updates over the coming months! These are the freshly painted wings for Missionary Air Group's Cessna 206. In the background, you can see the unpainted fuselage laying on its side for inspection and repair. This week I logged the 3000th hour of my apprenticeship with MMS Aviation! I now have less than a year before I meet the requirements to take my Airframe and Powerplant examinations. I appreciate your prayers and support as I continue to serve at MMS and get closer to the next phase of our ministry/training with Missionary Air Group. As I get closer to finishing my maintenance apprenticeship and move into the flight phase, we also need to be thinking about an organization to partner with, and where we would like to serve when we complete our five years with MMS and MAG. There are a couple of organizations we are interested in, but we are very open to where God leads us. Would you pray that He would continue to direct our path and show us the place where our family will fit well, can continue to grow and thrive, and where we can use our passions and abilities in service of God's Kingdom? Back in the Engine Shop! 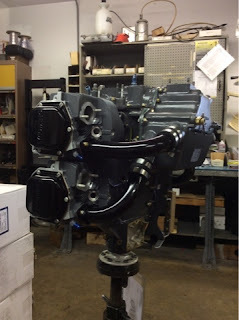 After completing the wing extensions for Life Builders International, I began working in the engine shop again. 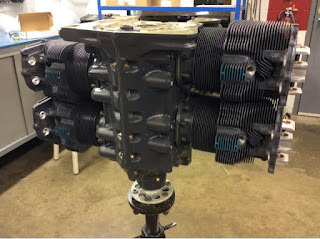 I am continuing to rebuild an IO-320 engine for The Harvest is Ripe ministries, and have finally begun assembling the engine. Before too long we will be putting it on the run-up stand! Here are a few photos of my progress. Accessory housing and valve train installed. Sump and induction tubes installed. It's looking like an engine! Last week, we finished the wing extensions for Life Builders International's Cessna 182. The airplane left MMS today and will have a little more work done elsewhere before being flown to Oshkosh. I wasn't able to get video of the airplane departing MMS, but here are a couple photos of the final product. If you read my last couple posts, you know that I've been working on wing extensions for a Cessna 182 owned by Life Builders International. The project is nearing completion! The wing extensions are installed, and the upper spar reinforcement is done. All that's left to do is one more reinforcement to the wing spar. Here is a brief update through photos. For those of you who don't enjoy the technical details, I'll try to post something less technical soon! The left wing extension is drilled and temporarily mounted to the wing to check the fit. Another view of the 182 with the left wing extension in place. In the background you can see Gospel Carrier International's King Air 200. The propellers for the King Air are also visible in the picture, on the hangar floor, ready for installation. Now that we're finished working through the new inspection holes, we can install stiffening rings and covers. Jim Newman trims the wing extension to clear the aileron [for those who don't know what an aileron is: it is a moving surface near the trailing edge of the wing, and controls the rolling motion of the airplane, allowing the pilot to turn the aircraft]. The wing extension comes to us oversize and in need of trimming. This allows flexibility for different installations. Now that the wing extensions are drilled, trimmed, and riveted into their final shape, we're able to finish off the wiring. The box mounted to the wing extension is the strobe unit, and the other wires are for the navigation lights. 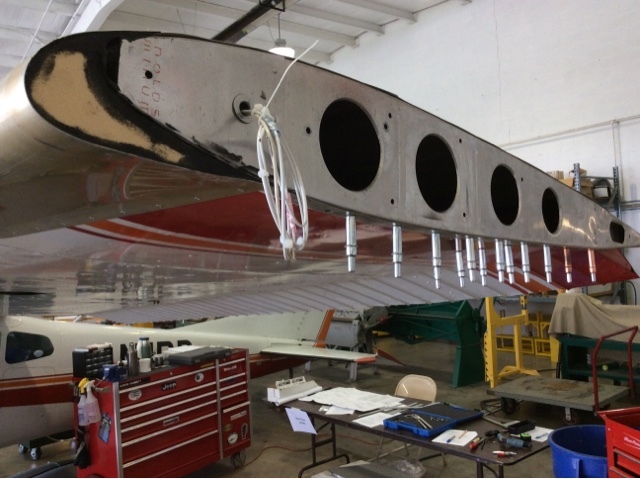 With the wiring complete, the original wing tip is placed on the end of the wing extension. 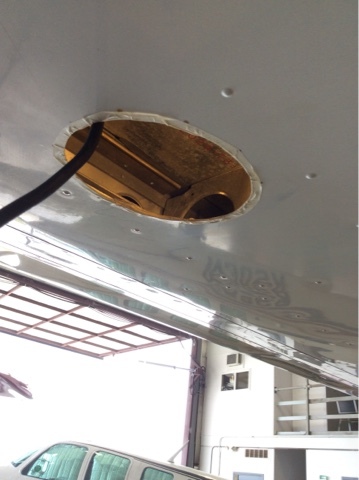 In this photo, you can barely see the four new vortex generators (VGs) we installed on the wing extension. The VGs are the little tabs on top of the wing, near the leading edge. The VGs change the airflow over the wing, primarily to improve performance near the stall speed of the airplane. After getting the right wing extension installed, we did the same thing on the left side. Jim is just touching up a few areas with gray primer. This view also shows the new VGs we installed on the wing extension. Thanks for reading! Check back soon for my final update! 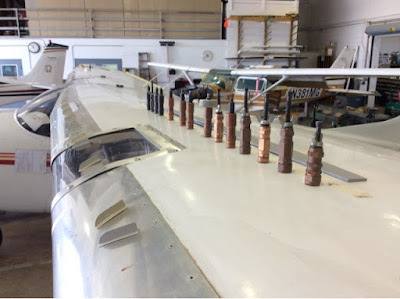 As I mentioned in the last post, I have been pulled out of the engine shop to help add WING-X wing extensions to a Cessna 182 for a mission in South America. The original goal was to complete the work today, but the project supervisor (Jim Newman) ended up being out of town yesterday and today. This left me to work on the project alone, as the interim supervisor (Mike Dunkley) finished up his own projects. Needless to say, this change (and the fact that the airplane arrived later than expected due to weather on Tuesday) set the project back a couple days. Despite working solo, I was able to make reasonable progress on fitting the wing extensions. The purpose of the wing extensions is to improve performance by adding wing area and increasing lift (you can read more on the WING-X web site). I also prepared to install wing spar reinforcements that strengthen the wing and increase the max gross weight of the airplane. Here are a few photos from this week. If you're interested in the technical aspects of the project, make sure you read the captions. 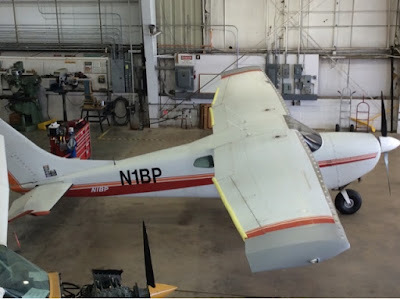 The Cessna 182 we're working on has several other modifications, including a composite propeller, larger tires, a Sportsman STOL (short takeoff and landing) kit, and vortex generators. Wiring modifications and rivet replacement, in preparation for wing extensions. Fitting the wing tip (darker gray) to the wing extension (lighter gray). The wing extension has to be custom-fit for this installation. I'm not sure where the horoscope cushion came from, but it worked well to prevent scuffing the wing tip! 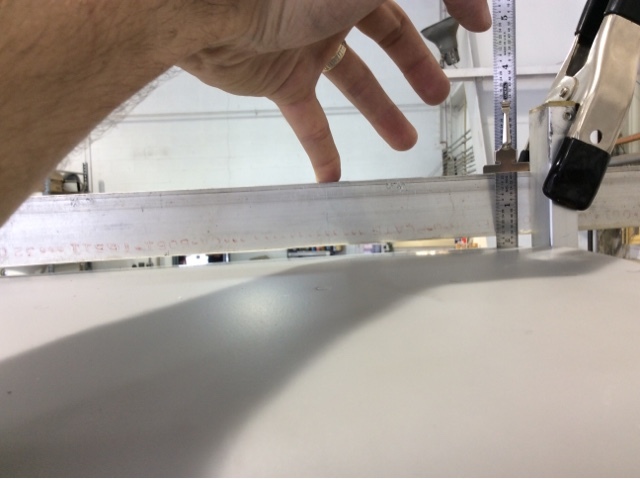 Using a straightedge to get the wing extension aligned with the rest of the wing. Several flush rivets had to be drilled out so the spar reinforcements can be installed. The rivet centers can be challenging to locate due to being covered with paint. 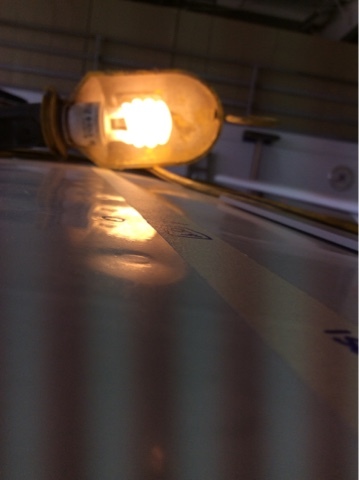 They are easier to see if a light is placed at the correct angle. A variety of Clecos (temporary fasteners) holds everything in place after the rivets are drilled out for the spar reinforcement. The gray reinforcements (behind the clecos) will be drilled to match the existing hole pattern, then riveted to the spar cap inside the wing. To install the spar reinforcements, we have to work through two inspection holes on the bottom of the wing. It's always fun to try to reach and see into the same five-inch inspection hole (especially when you have your arm in the wing past your elbow). To make clearance for the spar reinforcements, I had to grind away part of the wing rib, while ensuring that I didn't damage the spar. The small cutout in the center of the photo was made using a Dremel tool with a rotary file, and then finishing with a hand file. 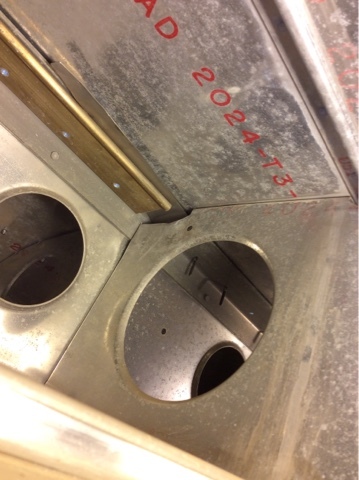 It may look easy, but working in close quarters, through an inspection hole, makes things interesting! Thanks for taking the time to read about my work. I appreciate your prayers as Jim and I try to get this job finished up early next week! For the past several weeks, I've been working in the engine shop overhauling a Lycoming IO-320 for a ministry based in Texas. This ministry currently works in Africa, and is expanding into Mexico. To facilitate this expansion, they have purchased a Piper Twin Comanche and sent one of the engines to MMS for overhaul. More parts removed, including the rocker box covers. Cylinders removed; crankcase and crankshaft remaining. 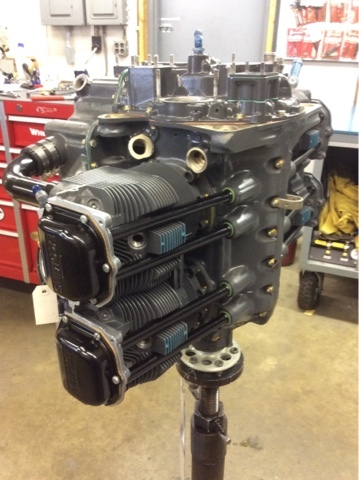 The crankcase was sent out for overhaul, and we painted it after receiving it back from the overhaul shop. The crankcase is painted and ready for reassembly. There's a lot more to this project, from paperwork to small repairs, making new hoses, and more. These photos are just a small glimpse into the work I've done so far. Now, for the "out of the engine shop" part of this post: tomorrow (Tuesday), a mission-owned Cessna 182 is coming from Chicago to MMS to have wing extensions installed. 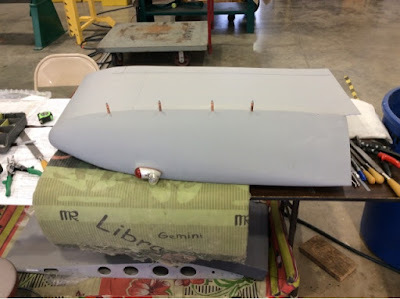 Unlike many of the projects I work on as an apprentice, this job requires a quick turnaround because the airplane needs to be displayed in mid-July at EAA Air Venture (the largest aviation event of its kind in the world). 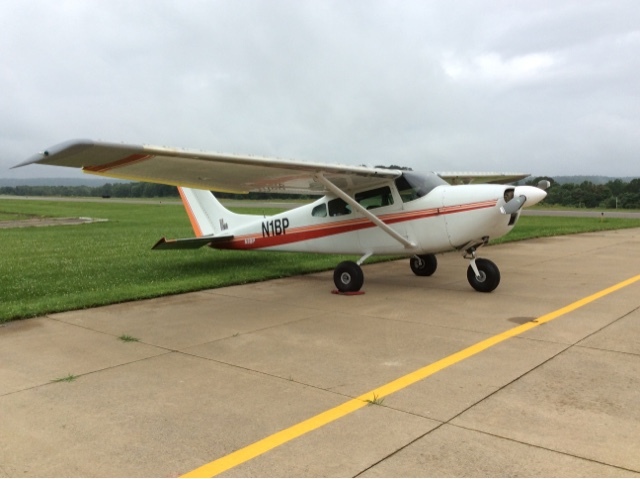 Since Jim Newman and I have done this job before on another Cessna 182, we were assigned to the project with the goal of completing the work by Friday (about 3-1/2 day turnaround). I appreciate your prayers as Jim and I work on the wing extension project this week. On the last project we encountered some complications that required extra work, and we are hoping things will go a little smoother this time! I'm a little anxious due to the time constraints, and the fact that this airplane will be displayed for as many as 250,000 people to see! However, I know I'm well prepared for the project by my prior experience at MMS, and trust that God will give us the ability to do the job well for His glory! After I finish the wing extension job, I'll be back in the engine shop working on the IO-320. 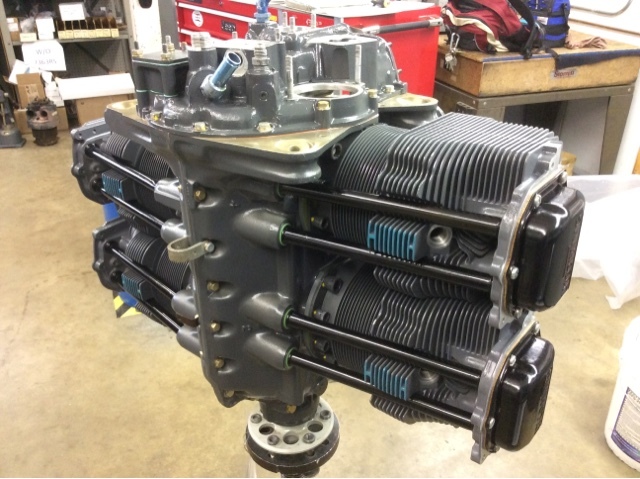 I will also be spending a week at EAA Air Venture in July, but before long, I'll be building the engine back up. Keep an eye on Facebook or Twitter for more frequent updates, or check back here every now and then to see how things are progressing! SIM's Cessna 182 is on its way to Africa! You may remember, if you follow our blog or receive our newsletter, that I had the opportunity to do some work on a diesel Cessna 182 for an organization called SIM. I installed wing extensions, shoulder harnesses, and some reinforcement kits on the airframe. So it was exciting when the ferry pilot stopped by MMS on his way to Bangor, Maine this past week! From Bangor, he was headed across the Atlantic and eventually down to Africa, where this airplane will serve with SIM. Here is a short video I put together showing the airplane, complete with survival gear and 100 gallons of Jet A (yes, this airplane burns jet fuel) behind the pilot's seat. Please pray for safe travels as Bill makes his way to Niger to deliver this plane to the mission field! I reached an exciting milestone today: I logged my 2400th hour at MMS Aviation! That means I have reached the halfway point in my apprenticeship! The FAA requires 30 months before I can take the tests for my airframe and powerplant certificate, and MMS adds the additional requirement of 4800 hours of logged experience. I've still got a lot to do between now and next summer, but I have a feeling that the time will pass quickly. As I get closer to the end of my time at MMS, Missionary Air Group is preparing for our family to arrive in Burlington, NC next fall. Sean Donnely and the other MAG staff are finalizing the flight curriculum, upgrading their fleet, preparing to move to a new location on the airport property, and bringing on the instructors necessary to provide quality training to future missionary pilots like me. You may remember that I am the first person to be accepted into this new partnership program between MMS and MAG, and it's exciting to see the details coming together! Since my last post, I've spent quite a bit of time working on the Cessna 206 for Mission Aviation Fellowship. Much of that time was devoted to the interior, and specifically installing the headliner. Aircraft interiors (at least the ones that we install) tend to require a lot of custom fitting and trimming, and this was no exception! After a lot of effort, I was pretty happy with the final product. 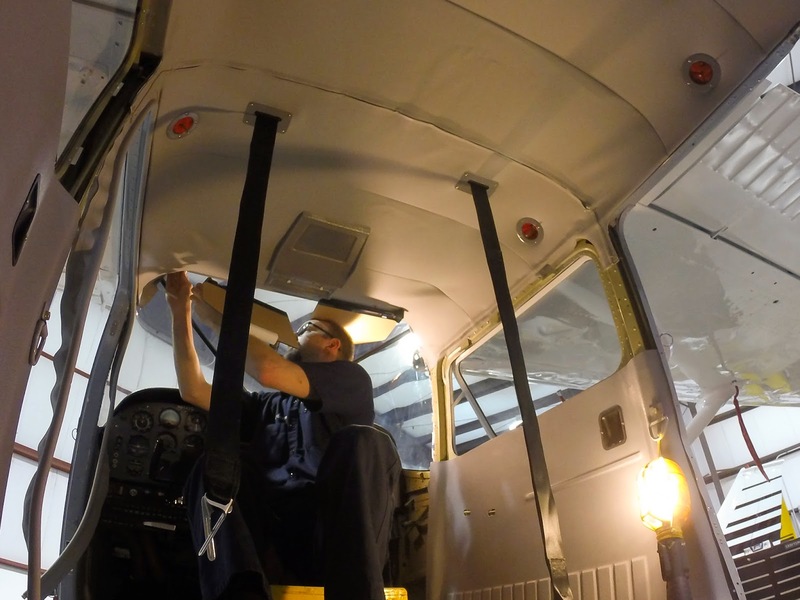 Putting some finishing touches on the interior of MAF's Cessna 206. After the interior was mostly complete, we took the airplane out for some ground runs. The engine has not run since this airplane arrived at MMS more than two years ago, so it was exciting to fire it up! The first engine run on MAF's 206. After the runup, we had a few problems to troubleshoot. I got those taken care of, and then moved into the engine shop for my first engine project. It's a Lycoming IO-320 engine for a ministry in South America. This video shows the teardown of the engine, and I plan to document my progress on this overhaul. Thanks for following our updates, and I'll try not to wait so long to post the next one! It's always exciting to see airplanes leave MMS. Not because we don't like them, but because they are going to fulfill the missions for which we've prepared them! 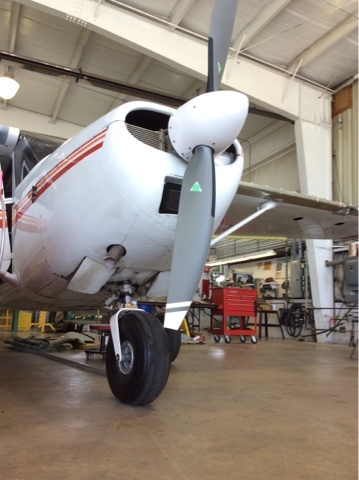 For many months, MMS worked on a diesel Cessna 182 for SIM, preparing it for service in Niger. I'd forgotten how much work I had done on this airplane until Jim asked me to sign the paperwork. 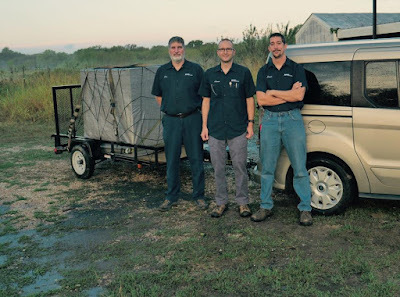 I had the privilege of helping with the installation of wing extensions, new shoulder harnesses, and some structural reinforcements, as well as some smaller tasks. Watching this airplane fly away gave me a real sense of satisfaction, and reminded me why I am here at MMS Aviation. It's an honor to be able to serve mission organizations like SIM, and to prepare these machines to help carry the Gospel of Jesus Christ around the world. Because, in the end, it's not just about working with airplanes. It's about the people that these airplanes serve . I can't wait to be on the "front lines" as a missionary pilot! But for now, I count it a true privilege to help send people and planes around the world from right here in Coshocton, Ohio! For several months, two men from Mercy Air (Matthias Reuter and Michael Aebi) have been diligently at work preparing a Eurocopter AS350 B2 for service in South Africa and Mozambique. In fact, the helicopter is desperately needed in Mozambique right now. Last week, the guys finished up their work, and it is shipping out to South Africa in the next few days. Below are a couple videos of the helicopter. The first one is from the initial test flight. The second video was taken Friday evening, when Matthias and Mike graciously offered us helicopter rides on behalf of Mercy Air. It was a cherished opportunity to see this great tool at work, and to have some fun in the process! Usually the mission organizations that are served by MMS Aviation bring their airplanes to Coshocton, and we work on them in our own facility. But every now and then, we send staff and apprentices to help with airplane inspections and maintenance on-site. We call these "rapid response" trips. Three weeks ago I had the opportunity to participate in a very rapid response. On Friday afternoon, January 23, MMS got a phone call from Northern Youth Programs in Dryden, Ontario requesting help with their Piper Cheyenne. NYP had an important flight planned, but realized that it was going to take more work than expected to get the airplane ready. When I told Tim (our director of maintenance) that I'd be interested in going to help, he asked me to discuss it with Tara and get back with him. At first, I didn't realize he meant, "Call her right now." But within ten minutes I had the okay from Tara, and less than 24 hours later Josh and I were in the van on our way to Ontario! I don't know if this was MMS's fastest response ever, but it certainly was rapid! I have only been doing aircraft maintenance for a year, so a part of me was concerned that I wouldn't be much help on the Cheyenne. But then again, as I look back on the past year, I'm amazed at how much I have already learned through my apprenticeship at MMS. Despite my relative lack of knowledge, I was excited about the opportunity to help another mission organization with a very tangible need. We arrived in Dryden Sunday evening, and got to work on Monday morning! We helped NYP's mechanic, Kenton, with many routine maintenance and inspection tasks, as well as fixing issues that were discovered during the inspection. Although this particular model of airplane was new to me, my training at MMS had prepared me well to be able to help with many maintenance tasks (and to know where to find the relevant information in the maintenance manuals). Unexpectedly, there was even a particular item that needed to be replaced on the PT-6 turbine engines, with which I was the only one who had prior experience. Among the things we worked on were: installing new control cables; painting, installing and rigging a rudder; re-installing a starter-generator; changing a tire; resealing fuel tank inspection panels; cleaning the landing gears; replacing a few worn parts on the engines; changing the air conditioner compressor drive and belt; repairing a fuel vent; reinstalling the interior; affixing heater pads that had come loose behind the instrument panel; and closing all of the inspection panels and engine cowlings. 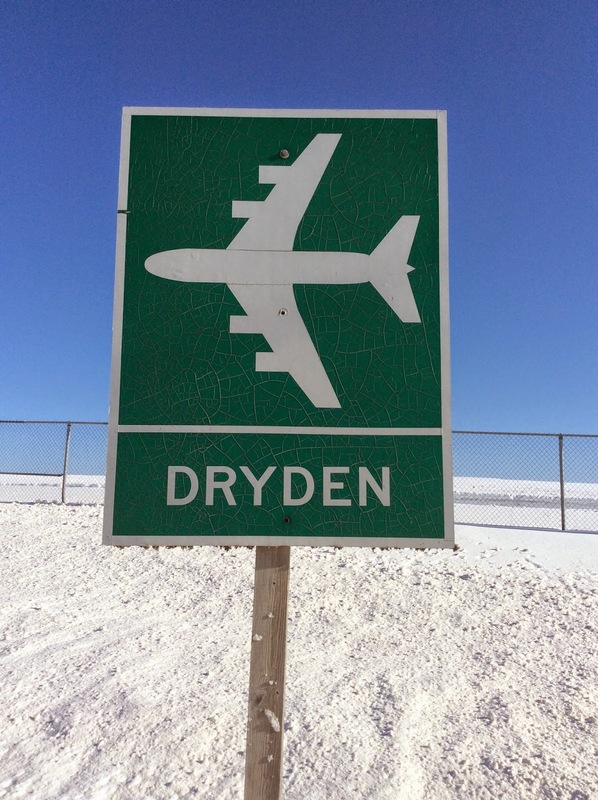 After ten days in Dryden, we had the airplane ready for a run-up! On Wednesday, February 4, Clair Schnupp (NYP's pilot and founder) performed a successful ground run of the Cheyenne. With only a few loose ends to tie up, Josh and I started driving home late that afternoon while Kenton took care of the final details. On Thursday, the airplane had a successful test flight, and by Sunday it had reached its destination in Northwest Ontario! I really enjoyed the trip, and I'm grateful that Josh and I were able to be an answer to prayer for Kenton and Northern Youth Programs. God could have used anyone, but by simply being available I got the privilege of being a small part of helping NYP fulfill their mission of discipling believers in Northern Canada! The video below is a highlight reel from my trip. I hope you enjoy it!